President and CEO, FreeFlight Systems, Inc.
View a video of Tim Taylor’s testimony. Chairman Graves, Ranking Member Velázquez, and other distinguished members of the Committee, my name is Tim Taylor, and I am president and chief executive officer of FreeFlight Systems. Today, I have the privilege of also representing the General Aviation Manufacturers Association (GAMA) and am honored to provide testimony to the Committee on their behalf. I appreciate the opportunity to discuss today the benefits of the nation’s transition to the Next Generation Air Transportation System (NextGen) for general aviation (GA) and to highlight the importance and ability of industry to meet the Federal Aviation Administration’s (FAA) 2020 automatic dependent surveillance-broadcast (ADS-B) Out mandate. 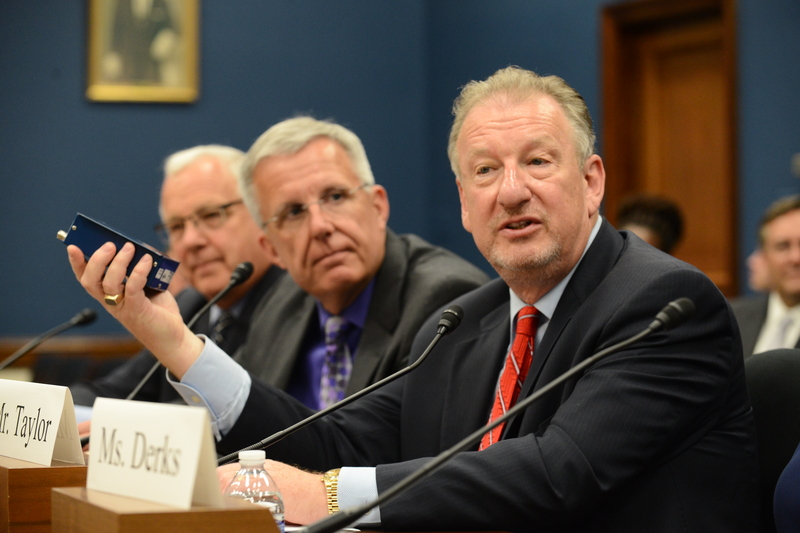 As the leader of a small aviation manufacturing business, I thank the Committee for holding this hearing and look forward to describing how NextGen avionics—specifically ADS-B equipage—is readily available, affordable, and easy to install. At a basic level, NextGen represents the shift from the existing radar-based air traffic control (ATC) system to a more automated aircraft-centered, satellite-based system. FreeFlight Systems designs, manufactures, and supports electronics systems that enable and support the NextGen air traffic management transformation. We are experts in the essential technologies at the heart of NextGen and we apply these technologies to platform equipage across a broad spectrum of air and ground vehicles, and to infrastructure development and services. Since NextGen equipage presents unique challenges from a retrofit perspective, we have focused on developing a series of core elements that can be easily installed into the diverse, and often quite old, aircraft fleet. We certified our first ADS-B Out radio in 2011, obtained our first installation approvals in 2012, and have delivered around 1,000 ADS-B radios and around 3,000 ADS-B position sources since then. As a small business, we made the research and development investments—more than $3 million—upfront to allow aviation operators the ability to meet the FAA’s 2020 ADS-B mandate. In short, we have already accomplished the “heavy lifting” required to make our solutions readily available, affordable, and easy to install. We are seeing rapid acceleration today in the adoption and installation of ADS-B systems in both airborne and airport surface vehicle applications. FreeFlight Systems does all this as a small business located in Texas that currently employs 53 people. We either perform or source our manufacturing in the United States, predominantly in Texas, but we are also part of the global aviation industry, exporting around 40% of our products. I should note that our exports are enabled in part by the Export-Import Bank of the United States (Ex-Im). Ex-Im guarantees credit that we grant to offshore customers, allowing us to access cash from our commercial banking partners at the point of sale. Like Free Flight, many other small manufacturers across the country depend on Ex-Im and we hope Congress will move the reauthorize the Bank before the end of September when the current authorization expires. While today’s hearing focuses on ADS-B, I would like to note that ADS-B is only one of a number of core capabilities that make up the broader NextGen program, including Data Communications (DataComm), Performance-Based Navigation (PBN) and System-Wide Information Management (SWIM), to name a few. The potential benefits of NextGen to the aviation community are significant. The transformation enables improved safety, increases the capacity of the airspace system, and reduces the cost and complexity of ATC. For GA operators, many of these benefits are immediately available upon appropriate equipage, but realizing the full potential of the broader NextGen programs across the National Airspace System will require significant additional work by the FAA. Before ADS-B, information on aircraft position was gathered by radar systems only and then used by air traffic controllers to separate aircraft. The current ATC system does this by drawing a bubble around each aircraft that represents its possible positions. As long as the bubbles do not touch, separation is assured. Using radar, these bubbles can be tens of miles across, and they are updated every 12 seconds or so. In contrast, an aircraft that is equipped with a rule-compliant ADS-B Out system is broadcasting key parameters once per second, along with a parameter that precisely describes the size of the bubble, for that aircraft. These ADS-B bubbles can be tens of feet across instead of miles. This high-quality, high-update rate broadcast allows ATC to better manage airspace and air traffic management, becoming more automated and less dependent on human decision-making. The transmitted information is also available to other aircraft that are equipped with an ADS-B In system, so pilots get that same high-quality traffic picture right in their cockpits. The FAA also provides an additional uplink to ADS-B users of Flight Information Services, which includes local and national graphical weather pictures, as well as important information about meteorological and other conditions across the system. This high-precision traffic picture has other benefits. Fleet operators, such as flight schools, can track their aircraft and ensure that they are operating in accordance with plan and procedure. Additionally, if an aircraft should experience difficulties, ATC can provide quick and precise direction to the aircraft. The more airplanes that equip, the more dramatic the improvements in capacity and safety become. The full potential can be realized when all aircraft in controlled airspace are equipped, which the FAA has mandated by January 1, 2020. The rule and mandate were established early in 2010, giving aircraft operators 10 years to equip. Equipment manufacturers have had longer. The system architecture was finalized in 2007 and the rules and requirements have not changed substantially since then. The ground infrastructure of the system is largely deployed and is operational across the country. There are no regulatory or infrastructure barriers to full equipage to meet the mandate. This long-term stability is essential if small businesses are to participate in the NextGen transformation. In addition to providing a consistent set of rules and requirements, as well as providing a 10-year window to equip aircraft, the FAA has taken other positive steps to ensure that rule-compliant equipment is available and ready for the marketplace. In several cases, the FAA formed “in-kind” partnerships with early adopters, such as Gulf of Mexico helicopter operators, and collaborated with them to work on installation and certification efforts, solve problems, and capture lessons learned. FreeFlight Systems was chosen by several of these early adopters to provide the avionics equipment for these activities and, in each case, it was a rich learning environment that allowed us to improve our product. Many of these aircraft have now been operating for several years, providing additional opportunities to test and develop the system. The products that FreeFlight Systems offers today are already third-generation, as we have been able to incorporate lessons from these early activities. Many other manufacturers have participated in these proving exercises across all strata of the National Airspace System. Mature, rule-compliant equipment is available today from multiple vendors for light GA, rotorcraft, business aviation, and airline transport aircraft. More products are entering the market this year. They are being offered both by the traditional major avionics suppliers and by some specialist small businesses, such as FreeFlight Systems. In fact, some of the major brand products are private-label versions of these small business offerings. In 2013, FreeFlight Systems was pleased to be awarded a direct FAA contract in full and open competition to replace early version ADS-B units with rule-compliant systems for several hundred aircraft in Alaska. These aircraft were part of the original Capstone ADS-B development program. This contract gave FreeFlight the opportunity to install our ADS-B equipment in a variety of aircraft types typical of the larger GA fleet. This experience gave us firsthand knowledge of installation complexity, time, and cost. FreeFlight Systems today offers rule-compliant ADS-B radios suitable for light GA  and rotorcraft in a variety of configurations, with optional internal global positioning system (GPS) receivers. We have installation approval for several hundred aircraft types (fixed and rotary wing), and we are constantly adding to this list. Additionally, we provide a range of rule- compliant, low-cost, stand-alone position sources that are compatible with other suppliers’ ADS-B radio offerings for all aircraft segments. For the light end of GA, ADS-B equipment can be relatively inexpensive and easy to install. FreeFlight Systems offers complete solutions today at a list price that is less than $4,000, and we are seeing installation times that are typically in the 20 to 40 hour range (with ~$2,000 to $4,000 for labor), for a total cost of $6,000 to $8,000. This estimate includes rule compliant ADS-B Out, as well as ADS-B In. In a newer aircraft, ADS-B In can utilize an existing display to show the beneficial navigation/situational information. In an older aircraft that has not seen a new piece of avionics since the 1960s, ADS-B In can simply utilize an iPad. Costs can be lower for aircraft that already have some elements of the system. Using the same products, uncertified aircraft can be equipped for less than $4,000. These prices appear to be acceptable to the light aircraft market. For larger aircraft, the costs become more dependent on the type of transponder fitted. For most aircraft, there is an upgrade path for the transponder and a FreeFlight Systems position source that lists in the range of $2,500 for light GA to $11,000 for larger aircraft. FreeFlight Systems offers a complete package for aircraft that operate in 18,000 feet to 24,000 feet range for $7,600. For heavier aircraft, the total cost is driven by the transponder manufacturer. Installation times for these systems are well within aircraft maintenance scheduled downtimes. In the past few weeks, we have seen aircraft near-misses at major airports in the United States. Management of aircraft in crowded airspace is a complex, fast-moving, four-dimensional puzzle. The nation’s air traffic controllers do an amazing job maintaining separation between aircraft. However, the tools they have at their disposal today have remained largely unchanged for decades, while capacity, aircraft performance, and aircraft mix are increasing dramatically. NextGen provides the capability to completely re-think and re-tool air traffic management. For NextGen to be effective, however, there needs to be a change in infrastructure and a change in aircraft equipage. The FAA has implemented the infrastructure and has provided details and complete rules for equipage, but for the system to work to its full potential, every aircraft that enters controlled airspace needs to meet minimum equipage standards or it will disproportionately impact operations. Think of all the ADS-B aircraft, safely inside their small bubbles, flowing smoothly in and around an airport. One un-equipped or poorly-equipped aircraft enters the picture with a bubble that is tens of miles across, pushing everybody else out of position and disrupting the system until it is safely out of the way. To avoid that scenario, everybody has to equip, and to equip properly. A mandate is the only way to ensure that happens, and to ensure that everybody who invested in the new system—industry, users, and government—gets the return they deserve on the investments they have made. The mandate also provides the framework for implementation of the system and equipage. In the light GA segment alone, there are almost 200,000 aircraft in the United States today. Not all of those are flying, of course, and not all of them need to enter controlled airspace, but between 120,000 and 140,000 aircraft need to equip. Currently, only some 4,000 of those aircraft are equipped. With approximately 2,000 days between now and January 1, 2020, we need to equip 60 to 70 aircraft per day—including weekends and holidays—or 85 to 100 aircraft per work day. As a nation, we comfortably have the capacity to equip at this rate, but only if there is reasonable linearity. The government has provided the environment to make equipage by January 1, 2020 possible. Industry has stepped up to provide the equipment at the right price point and has the capacity to install it. Before considering other actions that could be taken to further incentivize equipage, it is worth considering actions and messages that could damage the gains already made—snatching defeat from the jaws of victory. First and foremost, the mandate must remain in effect and the aviation community has to believe it will hold. If the community thinks there is any chance of delay, equipage will stop. Second, the rules that have been put in place need to stay in place—and the community has to believe that also. There are some well-intentioned initiatives like “Low Power Surveillance Equipment” (LPSE) that are designed to provide equipage options for aircraft like gliders with special needs. The general population sees this as an opening of the door to lower standards—and equipage will slow down while they wait to see how that plays out. FAA should consider such options where appropriate, but FAA also needs to clearly articulate that this is a limited exception and the fundamental requirements will stay in place. Additionally, the idea that has been suggested by some that equipage is going to get cheaper as we get closer to the deadline is misleading and a major reason for delay. The prices we are offering for equipage now are artificially low. FreeFlight Systems is making high-volume purchases and we have reduced our margin expectations to get products in the market at an acceptable price point. As volumes start to go up, we will not be able to hold these low prices. The same is true for installation. Forward-thinking installers, just like forward-thinking equipment suppliers, are offering low prices to get equipage started. In our view, the best incentives from government and industry are already in place: infrastructure, a firm schedule, stable requirements, and aggressive pricing. However, there is always more that could be considered. Low interest, government-backed financing has been discussed in the marketplace, and authorized by Congress, and is popular among FreeFlight customers. FreeFlight Systems announced a partnership with the Nexa Capital NextGen GA equipage fund and aircraft owners have responded favorably. I believe more aircraft owners would equip as the Nexa program becomes available, or other programs with a similar format develop. Unfortunately, the implementation of these financing options have faced delays and I urge Congress to examine ways to expeditiously move them forward. Additionally, inconsistency in the application of certification standards across different FAA branches and regions is a barrier to equipage and innovation in all areas of aircraft modification. Many NextGen programs are being given priority in modification approvals, but strong leadership, training, and consistent application of standards will reduce delays and increase the number of installers willing to aggressively price and perform ADS-B installs. The timely introduction of NextGen technologies is vital to supporting the safe and efficient operation of our nation’s airspace system, and to maintaining U.S. global leadership in aviation. The nature of the transformation is such that there are multiple opportunities for small businesses to participate, and a stable government position on equipage standards and timing for equipage are essential elements to the success of the transformation itself and to small business involvement. Government and industry, both large and small, have worked in harmony to ensure that equipment is available at the right price, that there is plenty of time to plan and execute installation, and that the infrastructure is in place to provide both immediate and potential longer-term benefits to those who equip today. While some initiatives could perhaps speed up the ongoing equipage of the fleet, the absolute key to meeting the equipage deadline is to hold fast to the current rules and schedules. Any wavering or mixed signals hurt NextGen progress, safety, and small businesses that are playing by the rules. Thank you for the opportunity to testify this afternoon, and I look forward to answering any questions that you may have. Aircraft weighing less than 12,500 pounds.